Give us this day our daily bread. Sourdough is such a staple in our house and brings so much joy from making it to enjoying it. A couple weeks ago after going to the apple orchard I decided to make Apple Cinnamon Swirl Sourdough Bread. 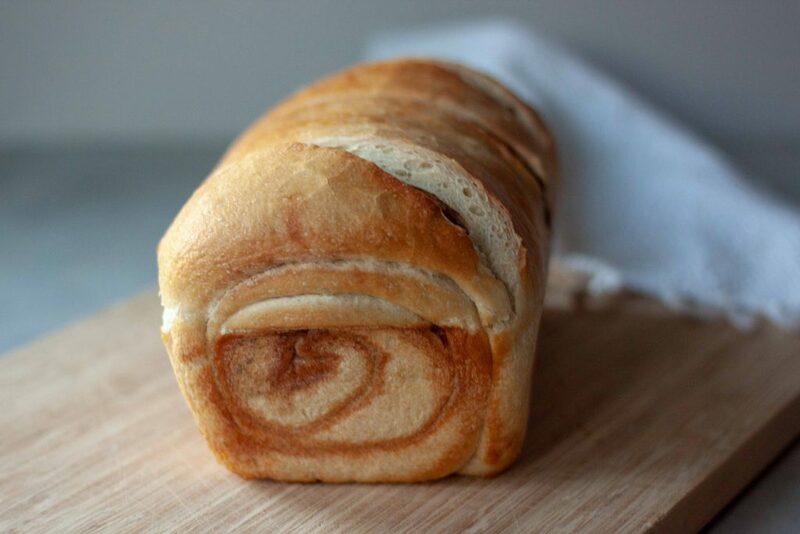 This was a first but once you have the basics down you will tweak and play and that is what I had planned to do adding apples to my weekly cinnamon swirl sourdough I make. I use to add raisins but often don’t anymore as they aren’t A’s favorite. I decided to share the idea and share the process on Instagram Stories. It didn’t work as planned but I adapted while making it rolling them in with the cinnamon instead of trying to knead them in like raisins (or craisisns and nuts like I did lasts week for my Cranberry Walnut Sourdough). As I mentioned things don’t always go as planned but hey we’ll see. Later sharing it turned out better than I had originally planned. I got so many messages from that story and the photo I later shared of it toasted up. Many people requesting the recipe so here it is! If you’ve followed along sourdough has been life changing as I’m gluten sensitive but after reading research we made it for Christmas almost 2 years ago and I was so shocked by how well my stomach handled it. Kept going thinking the joy would end but we are going strong still making it almost every week for almost 2 years now. You can read more here where I share Sourdough Boules or in the post I shared our Sourdough Bread Bowls. 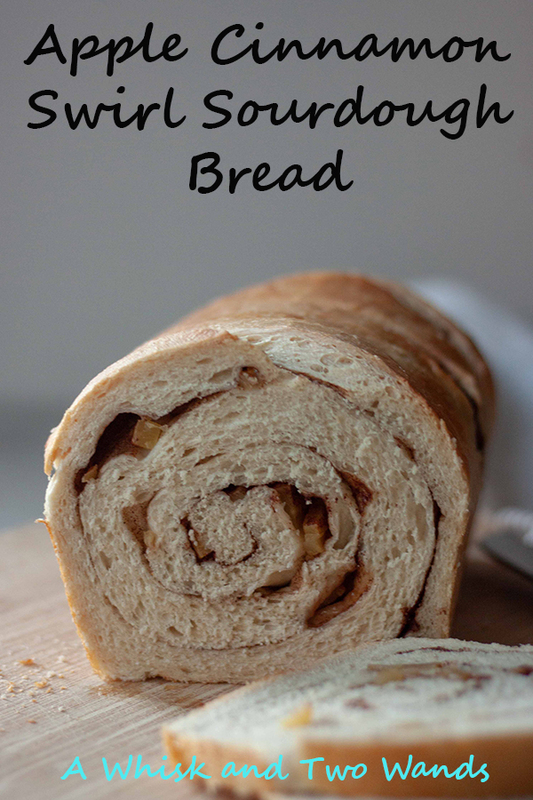 The sweet apples and cinnamon this bread is simple just as is or toasted up I find it just simply perfect and hard to put into words but the same happy tummy as if I was eating some apple pastry loaded with sugar yet it’s much healthier. Dare I say this is a life changing recipe. Even though sourdough is such a staple I don’t share too many recipes on the blog as I’m not sure how many people really want to see them and make it. It’s a time I like to just make and not worry about writing things down for a recipe or testing but more playing. Since it was requested I went back, measured, and tested. Sourdough is really easy and the process rewarding. It can be made by hand or with a Kitchen-Aid for those wanting to make it quicker and easier. It does take a little tweaking to find what works best for your environment but these are things you just learn and figure out as you go. Still making delicious bread it’s just fine tuning. Once you have the basic down the options are endless. I use the same process and recipe and I do a double rise which is one extra step but takes just as long (add 5 minutes tops unless adding add-ins like this than maybe 10 minutes) but is easier on my stomach. It just takes patience and time and by that I mean you can’t just decide this morning you want bread tonight. For ME the process takes about 29 hours from pulling starter from the fridge to pulling bread out of the oven but this is what works for me (initial feeding, feeding 8-12 hours later, making dough about 12 hours later/morning, waiting 3 to shape, another 4 hours later baking) those are rough times but usually within an hour of each. Ingredients for basic sourdough are just sourdough starter, water, flour, and salt. I know it might seem intimidating but honestly it just happens without even thinking about it now. I usually use my Kitchen-Aid and make the dough as I’m making coffee or breakfasts. Shaping around lunch, and then baking in the afternoon. If making on the weekend then the schedule is a little different and I just adjust based on schedule. When I have more time I actually find it very therapeutic to make bread by hand and not use the mixer. By hand or with a mixer the choices is yours. I will make a couple suggestions if you want to make the best sourdough bread. You will need a kitchen scale, which you can pick up pretty cheap at Target, Amazon, Williams Sonoma, ect. It will require sourdough starter (you can make your own or buy it), and a glass jar with a tight lid to store your starter. It will take a few days to get your starter to the point you can make bread if it is your first time but once you get there you just keep pulling starter and you can make it anytime. If your starter is sitting out you will need to feed it regularly but if you aren’t going to use it you can store it in the refrigerator for up to 10 days and pull it out when needed. Meaning you can feed it so about 29 hours before you want to bake your bread. You will need bread pans, a bread towel to cover your dough as it rises, and a large bowl and or ice cream pail. Not required but I highly recommend 2 additional items for the best texture bread, a baking stone (not needed if baking in a pan) and Mexican beach pebbles. We’ve had our baking stone for over 16 years as it was a wedding gift and use it all the time for pizzas and bread so I think well worth it, well if you plan on making bread or pizza. However if your making all your bread in a pan you don’t need the baking stone but we always use it anyways as it’s almost always in the oven. The rock is for injecting steam into the process and you can pick it up really cheap ($10 and it is twice as much as you need) at a home improvement or landscaping store. Just make sure to wash it before your first use. With the rock you put it on a rimmed baking sheet in the bottom of the oven on the lowest rack setting. The baking stone in the middle. You will pre-heat the oven an hour before baking bread with the stone (optional) and rock in the oven. When adding the bread to the oven you will carefully want to squirt the rock with water and shut the door to trap the steam in. I use a pastry bottle with a tip but you can use a plastic water bottle with a hole drilled in the top or even a water gun if you want to. Back to the Apple Cinnamon Swirl Sourdough Bread, this will be made the rest of the year on occasion because right now I’m obsessed with apples (pregnancy craving maybe since it’s more than usual) and I want to say I might even love it more than classic cinnamon raisin bread. I would trade it for an apple strudel or turnover which if you know me says a lot and like I said it’s healthier and just simply delicious! I’ve written the recipe for 2 standard loaves of bread as that is what I typical make for our family. I usually do one plain and one cinnamon or in this case Apple Cinnamon Swirl. 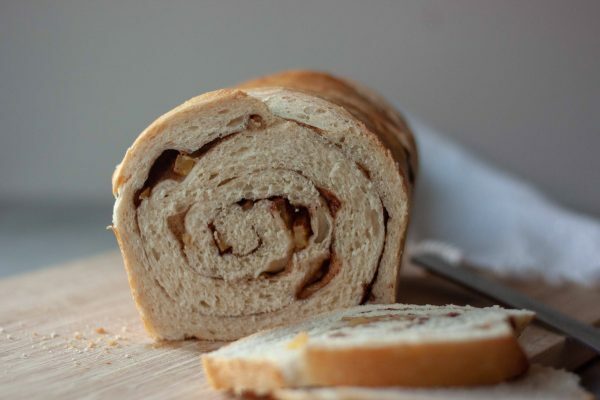 If you would like to make one plain loaf of sourdough and one Apple Cinnamon Swirl Sourdough Bread use half the amount of apples, cinnamon sugar, and coconut oil. 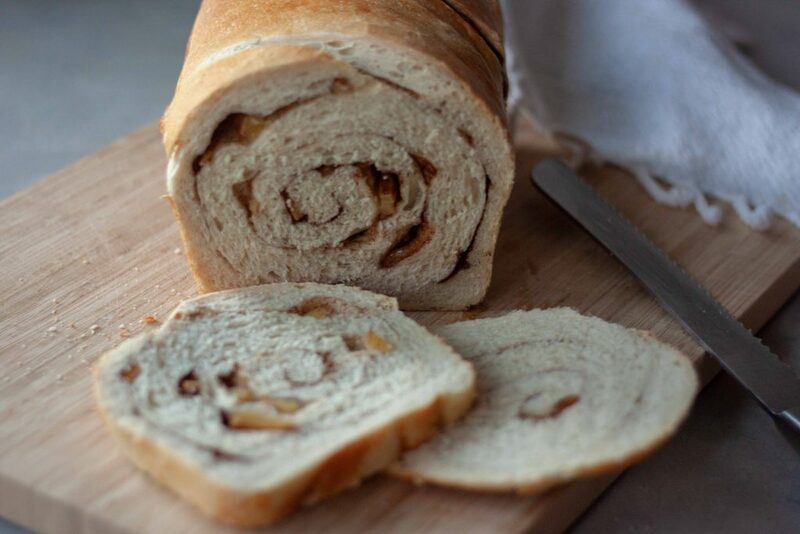 Or feel free to make 2 loaves of Apple Cinnamon Swirl Sourdough Bread and share one with friends or family as they will appreciate and love it! Warning though once you share people will always be requesting it. If you have any questions please feel free to reach out here or on social media (Instagram or Facebook) or email me for a quicker response. I know it might seem intimidating or hard but honestly after you make sourdough a couple times you will think it’s so easy, make it all the time, and encourage others to make it too. If you make it and don’t have questions please let me know how it turns out, leave a comment below or tag me on social media. If there are more requests and you want to see more I will continue to share more bread recipes here. You can always see more real time sourdough creations on Instagram. On my Instagram profile I even have Highlight called Sourdough where I walk through the process step by step and also share more sourdough fun. 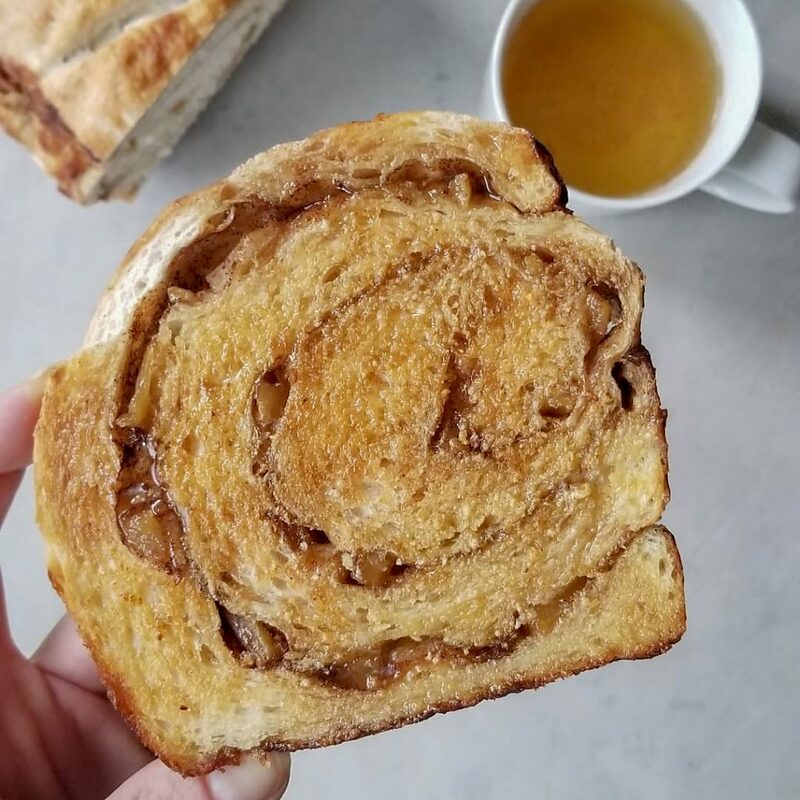 With only a few simple ingredients and a little patience you can make simple delicious Apple Cinnamon Swirl Sourdough Bread! Not only does it taste simply amazing but you will feel like a master chef after you conquer this what might seem intimidating recipe that is easier than you think and be the envy of friends and family! Pull about 150g of unfed sourdough starter and place in a large container that has a lid (we use an ice cream pail). *If you are using fed sourdough starter skip to step 7, you will need appoximatly 1300g of fed sourdough for 2 standard loaves of bread. Feed starter equal parts by weight (150g) of flour and room temperature water to have approximately 450g of starter. Place the Kitchen-Aid mixer bowl on the scale and tare it. If not using a mixer us another large bowl. Start mixer on lowest setting then add a small amount of water at a time. If not using a mixer use a wooden spoon or spatula and mix by hand as much as possible. Do this about 5-10 seconds apart and keep adding water little by little until dough comes together. Turn mixer up one more speed (2 on our Kitchen-Aid) and let mix about 10 minutes until dough looks smooth. If not using a mixer you will knead it by hand on a clean smooth surface (could take about 20-30 minutes). Dough should be extremely pliable and pass the “window pane” test where a piece of dough can be stretched where light can pass through it without breaking. Let sit and proof for 3-4 hours in a warm area. Grease 2 standard laof pans with coconut oil and set aside. Prepare apples at this time. Remove dough from the bowl and divide in half. Roll and stretch each half out into a 9"x about 24" regtangle. Rub coconut oil between the palms of your hands to warm and on the dough. Sprinkle each with half the cinnamon sugar and diced/chopped apples. Carefully roll and place seam side down in greased loaf pans. *If making one plain you can knead and (shape into a log) the other half of the dough and just place it in the prepared pan. Slide bread bowls, keeping them on the parchment paper, directly on baking stone and quickly squirt water on the rocks to generate steam and close the door. For a bread bowl cut the top off and pull out the insides (dry out and use for bread crumbs in recipes or toast for croutons) leaving enough on the sides and bottom so you don’t have any holes or thin spots the soup would leak through. *If you are using fed sourdough starter skip to step 7, you will need appoximatly 1300g of fed sourdough for 2 standard loaves of bread. *As written this is for 2 loaves of bread, if you would like to make one plain loaf of sourdough and one Apple Cinnamon Swirl Sourdough Bread use half the amount of apples, cinnamon sugar, and coconut oil. This is what I typically do for our family. *You need to start with 150g of unfed sourdough starter. If you have a friend who makes sourdough you can ask them (we love sharing ours with friends and family) or you can purchase sourdough starter online (we purchased ours off Amazon almost year ago and it's still going strong) or make your own. If purchasing it will take a week to two of feeding your starter to get to the point of it being ready to make bread and to have 150g. Don't worry though once you do that you will always pull starter from what you're making to save for the next time, you will just need to follow instructions for storing your starter. Thank you! If you try it you’ll have to let me know! This must smell amazing. I love the addition of apples in there! Thank you, it was one of those ideas that turned out better than expected! I know the feeling! Wish I could share a slice it would be perfect with your coffee. I love all things cinnamon, and why is it that cinnamon tastes especially sweet in the fall! This is a gorgeous recipe! Thank you Kelly! Cinnamon is one of the best and most comforting spices! 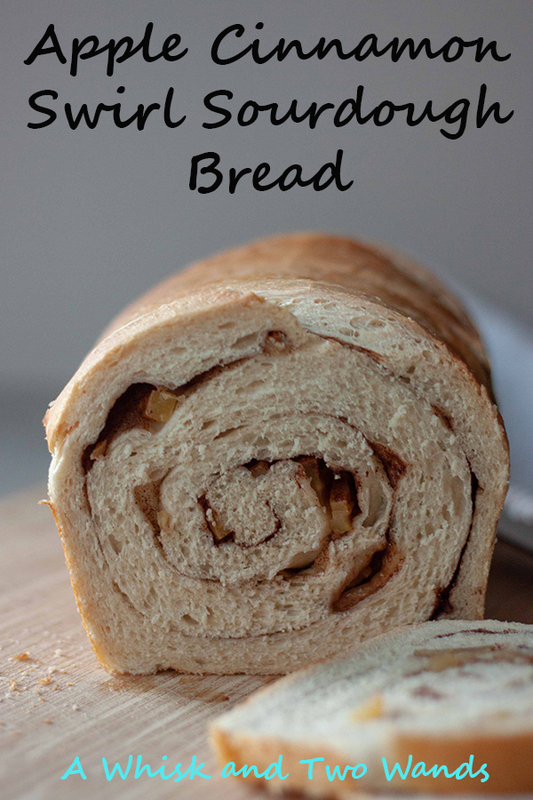 Apple Cinnamon Swirl Bread – WHAT!?! Looks amazing – I love everything about it!!! Is that Cinnamon Bread time of year! 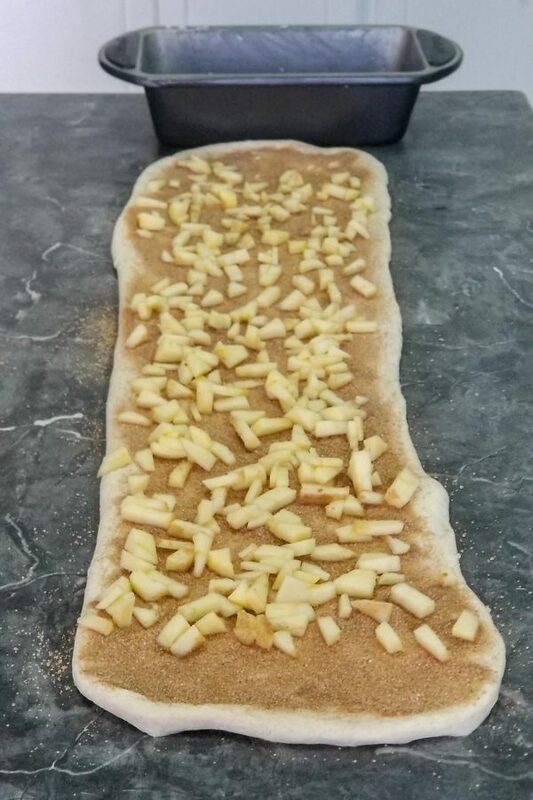 This looks so yummy and I love the addition of the apples – what fun to make! Thank you Jules! Working on a gluten free one for a friend but waiting on my gluten free starter and timing it out so I can whip down my kitchen before. I know you’d both love it! Do you make your own sourdough? 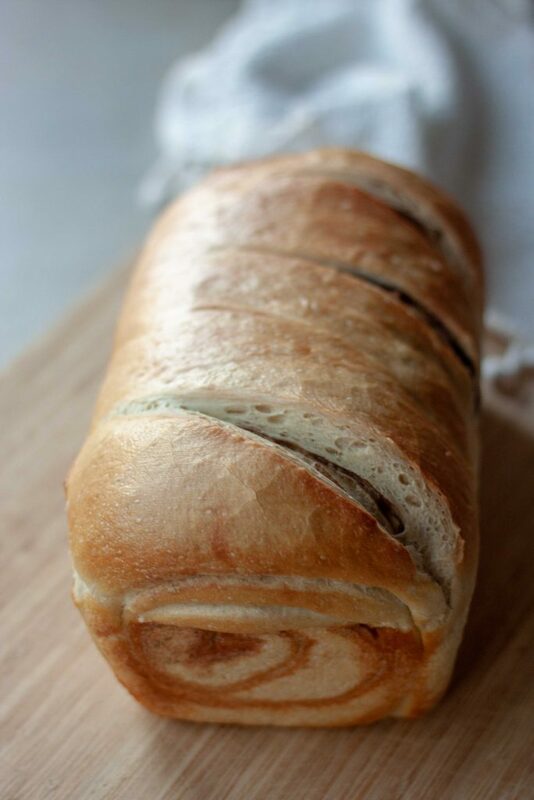 This looks like a dream – I’m so craving bread right now! Sarah, do you have a post for making sourdough starter? I don’t have a post for making the starter. There are many out there on how to make your own or I highly recommend getting starter from a friend, we are always sharing ours, or purchasing Cultures For Health Sourdough Starter. 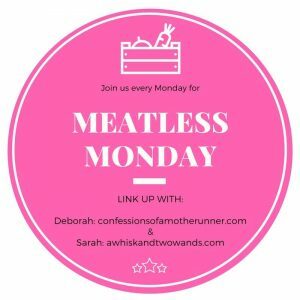 It comes with easy to follow directions and once you have it as long as you feed it or maintain it in the fridge/freezer you don’t have to ever make it again. They also have the easy to follow directions for making your own, https://www.culturesforhealth.com/learn/sourdough/how-to-obtain-sourdough-starter/. Maybe I’ll have to update the post with a link and options. 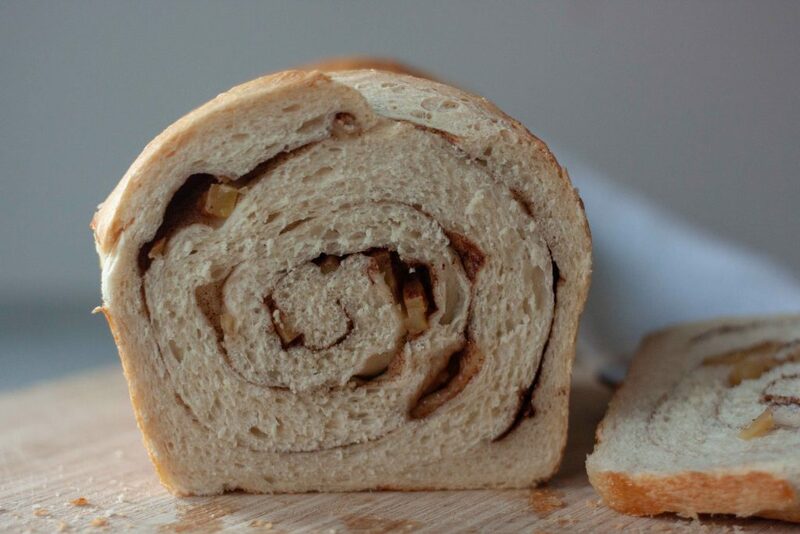 apple cinnamon is a great combo for bread. Perfect for fall.